Park Smart - School Gate Parking. "Keep a child safe by parking considerately when dropping off and collecting children from school" - that is the message of two campaigns aiming to generate awareness of sensible parking during the school run. Aberdeenshire Council’s Transportation Team is launching Park Smart whilst the Garioch and North Marr Community Safety Group is starting a similar initiative. Both campaigns will see colourful banners being displayed outside schools where there are parking problems. "The safety of pupils is of paramount importance. It is pleasing to see the Group and council officers working together to raise awareness of this important issue. "Taking a few moments to think about parking sensibly can make such a difference. Parents may also want to think about parking further away from the school so they can walk together with their child. A bit of fresh air can help stimulate your son or daughter before they begin lessons, helping them to perform well in the classroom." The year-long campaign, Park Smart, will provide schools with resources and information, classroom lesson plans as well as homework that can be used in intervals throughout the year with the intention of creating long-term behavioural change. It is intended that Park Smart could be rolled out to other schools in future. "We know that some pupils need to be driven to school, and that most drivers behave responsibly. But the actions of a few are putting pupils, parents and staff at risk. 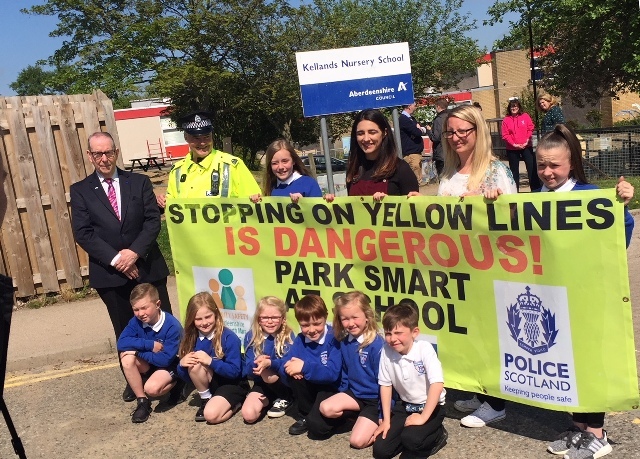 Park Smart and the North Garioch and Marr Community Safety Group’s campaigns’ will help pupils and people bringing them to school understand why it is important to park responsibly, every day. "It’s part of a range of work that the school is leading on to reduce congestion and road safety problems, and we’re pleased to have recently been awarded Cycle Friendly School status by Cycling Scotland. I encourage all members of the school community to question whether they need to drive on a regular basis, and if they do to always park or wait in locations that don’t endanger other people." "It is only a matter of time before an accident happens. It is a danger to children when people park on double yellow lines - luckily no one has been injured yet. "Whenever we come to patrol at the schools, parents regularly tell us that they are glad we are there - our top priority has to be the childrens' safety. "The banners are up at all the schools now to try to raise awareness - you would have to have a real brass neck to park next to one of those."